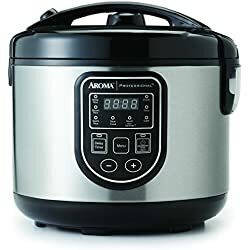 The Aroma ARC-838TC is a basic and easy to use rice cooker that most folks will find useful around the kitchen. Its simple interface is not confusing and has a 15 hour delay timer for programming an approximate finish time. The cooker has an 8 cup water capacity which means it can prepare up to 24 cups of cooked rice (white rice). However, we hear this unit is not the most prompt as far as getting a batch of rice done in good time, (30 to 45 minutes) but when it does, the quality is on par. We should also mention that the Aroma ARC-838TC is not the best unit for cooking brown rice, and is best suited for white rice. Another thing folks will like about this rice cooker is the steaming benefit. The included tray will hold enough vegetables that is good for about 2 to 3 people which can be steamed simultaneously while the rice is cooking. And speaking of steam, let us also include a little warning: do not place this unit directly under cabinets!. From what we gathered, this specific 8 cup Aroma rice cooker has a steam vent that acts as if it is an early 19th century locomotive. In time, excess rice starch and moisture may ruin the bottom of your cabinets so be sure and give this cooker room to vent. To get cooking, like most basic rice cookers of this type all folks need to do is add the proper water to rice measurements using the included cup and water level gauge inside the bowl, plug the unit in, and press the start button. The Aroma ARC-838TC cooker will handle the rest, all without the worry of a starchy boil-over unlike cheaper top lid models. To add an update, we would like to state that this cooker will not ruin a batch of brown rice, but due to its longer-than-average cook times, it will take several attempts to get right. For such preparation, there are other models on this site worth considering over the Aroma ARC-838TC. Check out the Aroma ARC-1000 for better quality brown rice cooking. However, for folks who eat white rice a majority of the time, this cooker is fine. It earned a “Good” rating only because it acts as a steamer as well…or else it would have received a “Fair” rating due to the long cook times and lack of features for specific rice types. But overall, good for average-sized families that want the convenience of cooking rice and steaming healthy vegetables in a unit that is not too costly or complicated.